Sanders supporters are understandably excited by his surprise victory in Michigan, but few take for granted that he will continue to build momentum for the nomination. The corporate media and the DNC seem determined as ever to continue promoting the myth that Clinton will be the inevitable Democratic candidate for president. Despite the fact that her positions are largely out of step with the Democratic mainstream, the rationalizations for voting for her remain persuasive for a large proportion of the party faithful. Bernie will need to take advantage of every opportunity to tap into that segment of the electorate hungry for change. While it may seem counterintuitive, Trump supporters may provide the margin he needs for victory. The consensus opinion on the left is that Trump’s appeal is based on his racist positions on immigration and his Islamophobia, both of which attract the most extreme right wingers who disproportionately support Trump. However, James Robertson offers a persuasive argument that that is not the case. He concludes that Trump’s base is composed of a wide spectrum of conservative voters who are tired of being taken for granted by the lies of the corporate politicians who comprise the establishment of the Republican Party. His powerful argument explains why Trump continues to build support despite his wildly inconsistent views, many of which contradict conservative dogma. If Robertson’s thesis is correct, it suggests that Sanders and his supporters have a unique opportunity to forge an alliance between left and right. With the right approach, they could unite moderate dissidents across the political spectrum around issues of common concern. While the idea will strike many as far-fetched, it has also been suggested by at least one conservative blogger who makes a strong argument for it. In addition, as Sanders pointed out in the FOX debate, he was reelected by a nearly 3:1 margin in 2012 in the most rural state in the union. While Vermont is exceptionally liberal for a rural, largely white population, it still has a significant proportion of conservatives. While it remains to be seen how many conservatives would be willing to register Democratic in the primaries in order to vote for Sanders over Clinton, there is no doubt this is a demographic that Sanders would want on his side in the general election. 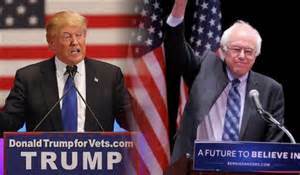 The more successful a primary effort to sway conservatives who are developing doubts about Trump, the stronger will be the argument that Sanders is the best candidate to prevail in the general election, despite the assumption by many that his self-identification as a “socialist” will doom him. It would be naïve to think this will be an easy task. The corporate media remains a powerful force to reckon with. However, the more that Sanders and Trump defy its predictions the clearer it will be that Americans will need to tune out the echo chamber and learn to think for themselves. Should they face off in the general election, they will present the clearest choice of what kind of nation we want to be since the “Second Revolution” in 1800, when Jefferson defeated Adams on the promise that ours would not be a government that dictated to the people, but one that responded to the popular will. Our goal as Americans should not be to assure that one or the other of the Duopoly parties wins, but to elect a president who can best address our common problems. We are at risk of leaving the next generation of Americans to be the first to have a lower standard of living than their parents. Fortunately, the media is performing at least one useful function that could help us change the tide by electing a champion of the People: It is informing the Trump supporters about why it would be so dangerous to elect a megalomaniac with no experience in politics and little understanding of how to do anything but appeal to the anger of his base. It is up to us to make them understand that they have an alternative in an independent who shares their anger at the corrupt Duopoly establishment. The key is to do what Sanders supporters have largely failed to do in trying to convince Clinton supporters to adopt their point of view, which is to treat their differences of opinion with respect. That is not as hard as it seems. We are used to having these discussions with others who consider themselves liberals and many of us have been shocked at the anger that greets any criticism of the anointed heir to the Obama presidency. It really shouldn’t be surprising that normally rational people get upset when people who agree on goals agree acknowledge what seems obvious to them: we cannot continue to accept the choice of corporate politicians in the DNC and expect to ever achieve the goals of the progressive agenda. There is a simple reason that we need a political revolution, but for some reason the message is not sinking in with many of the Democratic Party faithful in the baby boomer generation. To paraphrase Bill Clinton’s campaign slogan, “It’s the corruption, stupid!” That is a non-ideological message progressives should be able to sell to conservatives. It’s easier to be patient when you go into a discussion expecting disagreement, as long as you do not fall into the trap of expecting the other person to be convinced on the spot. It’s a matter of planting the seeds and letting them mature in an environment that is becoming increasingly hostile to both Trump’s extremism and Clinton’s cynical corporatism. Only the most dedicated Clintonite would argue that it is naively idealistic to worry about it the corruption of the system. It is certainly not an attitude we are likely to get from Trump supporters. We can expect wide agreement on this fundamental issue from conservatives who have recognized that politicians claiming to represent them are lying. We are witnessing the fracturing of the façade of the Duopoly in the face of its glaring hypocrisy. The success of Sanders and Trump in their respective races has challenged the complacency of the corporate core of both major parties. This is a moment of historic opportunity to not only unify the left around a progressive agenda, but to gain support for it from many self-identified conservatives. Doubters should remember that there is historical precedent for this. Roosevelt was elected after a period of Republican dominance that led to the Great Depression. It was that economic pain that led Americans to challenge the simplistic beliefs they had bought into by Republican corporatists during the relative prosperity of the 20s. In the midst of our ongoing Great Recession, we should be able to do the same. Stripped of ideological rhetoric, Sanders’ platform is a common sense approach to getting America back on its feet. Given the extraordinary importance of challenging the three major free “trade” agreements currently being considered, it is remarkable that Democrats have spent so little time discussing the differences between Clinton and Sanders on the issue. While it is perfectly understandable that the corporate media would continue to ignore the explosive consequences of TPP, TTIP and TISA, it is concerning that more attention has not been paid by voters who would be affected by the massive transfer of government power to transnational corporations. For those who need reminding, the issues involve preserving national sovereignty, protecting internet freedom, allowing governments to control the devastating consequences of reckless financial chicanery by Wall Street, preventing the pharmaceutical industry from gaining even more power to rip off governments and consumers, promoting the interests of Monsanto and other powerful corporations, and much more. The media blockade of information about the negative consequences of free trade has resulted in most Americans being ignorant of the consequences of the neoliberal philosophy of free trade. These policies have been championed by the Clintons and Obama and staunchly opposed by Sanders, highlighting the difference in their priorities. Establishment Democrats show allegiance to the transnational corporations that dump money into their campaign coffers, while progressives like Sanders are fighting to hold the line against increasing corporate power over governments and the people they are supposed to represent. Clinton’s shifts of position on the Trans-Pacific Partnership are particularly revealing. After playing a pivotal role in negotiating the secret trade agreement, she began to express doubt about it around the time it became obvious she preparing to announce her run for the presidency. For months, she refused to take a firm position on the issue. Then, in an turnaround that surprised many (but shouldn’t have), she stated that she opposed the final product. Seemingly learning for the first time that it contained no real protections for American workers from the job losses that all free trade agreements produce, she disavowed her own work. Some think that it was no coincidence that she had this change of heart after Sanders had been quite vocal in his opposition to the increasingly unpopular agreement, as were unions. For those whose memories are longer than the latest news cycle, this should have come as no shock. Although she claims she has always opposed NAFTA, her contention is demonstrably false. She very publicly promoted it when it was being sold to America in 1993, over the strenuous objections of labor and environmentalists. Her supporters also seem to have forgotten that she insisted during her 2008 presidential run that NAFTA had to be renegotiated. Although he proved to be a strong free trade advocate himself, Obama jumped on her inconsistency at the time. Her apologists say it is unfair to criticize her for what happened during her husband's administration. They fail to acknowledge that she launched her political career as “co-President." Thia was the main qualification she had to run as a carpet bagging Senator from New York. Whether she really privately expressed reservations about NAFTA prior to its passage is irrelevant. She clearly had her eyes set on a political career at the time, and was under no obligation to actively promote a policy she opposed. That is practically the dictionary definition of hypocrisy. Clinton’s claim that she was suddenly persuaded to oppose TPP because of failures that were evident in the agreement as she was helping to negotiate may seem disingenuous, but it would seem to be buttressed by her vote against the Colombian Free Trade Agreement. I say it would “seem” so because recently released emails indicate that she was privately lobbying for the agreement even while publicly opposing it. One of the main objections to CAFTA, in addition to its typical lack of protections against job losses and environmental degradation, was the fact that union organizers in Columbia were being systematically murdered by right wing paramilitaries who appear to have been funded by the virulently anti-union Coca-Cola corporation. No problem for Clinton. She just claimed that the problem was improving, even though the number of murders the year before its passage was near record highs. Her blatant disregard for the lives of Central American workers mirrors her lack of concern for the lives of Hondurans murdered by a coup government she supports or their children, who are sent north unaccompanied by desperate parents hoping to spare them the violence that now plagues the nation. Her position on what to do about the flood of refugees from the violence of right wing US-backed governments in Central America is clear: Send them back. The Battle in Seattle against the WTO in 1999 gave hope to millions of people who understood the significance of the increasing power of transnational corporations over government. It was considered to be the opening shot in a war to defeat the neoliberal movement that was gaining unprecedented power during the Clinton co-presidency. Unfortunately, corporate power brokers upon which the Democratic Party establishment have allowed themselves to become dependent are better funded and organized. They are winning the war to establish David Rockefeller’s dream of a one-world corporate government, where nations would become an anachronism. Using their power over the mainstream media, they have hidden this reality from most Americans, even as they do it in plain sight. The time to redouble the fight against neoliberalism is now. With a vote on TPP looming and the potential for worse to come, we can use the fact that both candidates for the Democratic presidential nomination and the leading Republican contender are on record as opposing TPP to rally opposition. We have to keep in mind though that only one of them has actually been in the front lines of this fight before now.